Information on the Brown Hare. Brown Hares (left) are often confused with Rabbits (right), although they are really quite different in many ways. Hares are much larger, with longer, black-tipped ears and more powerful hind legs. They also have a quite different lifestyle to that of a rabbit. 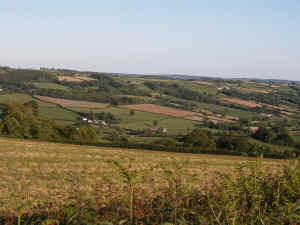 The main habitat of the Brown Hare in Britain is open farmland. Unlike Rabbits, hares do not dig and burrow into the ground, but instead live their whole lives above ground. They do not have a particular 'home' and will sleep in any suitable place, continually shifting from one place to another. 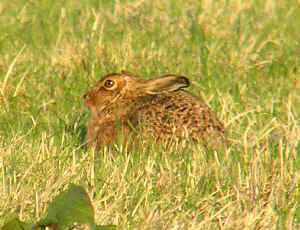 When a hare rests, it will usually scrape away the vegetation and then lie down on the bare earth. Where a hare has been lying, a shallow depression is made, which is a bit deeper and wider at the back than at the front. This is known as a 'form'. They are often made in the shelter of a grass tussock or a rock which will give some protection from the wind. Forms which are used to give birth to young may be lined with fur which the mother has plucked from her own fur coat. Hares can have between 2 - 4 litters of young a year, usually between February and September. The young are born in the open, with a full coat of fur and open eyes. The young hares are known as leverets (left) and each one in a litter will be left in a separate form of its own. They are able to leave their birth place very soon after they have been born. Hares protect themselves in their forms by lying as still as a statue, tucked in close to the ground with their ears pressed flat along their backs. A hare will not move until the last minute before it is discovered, as its best defence lies in stillness and camouflage. Once it is up, it can run incredibly fast, up to 35 miles per hour, although this is saved for escape and they generally lope along at a much more leisurely pace. 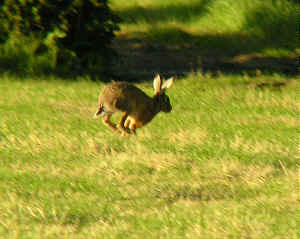 In March and April, hares can often be seen going 'mad', leaping about and having wild chases with each other. 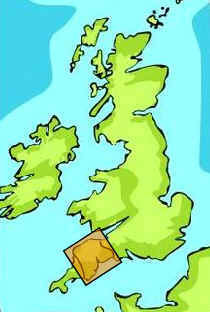 They will sometimes also have 'boxing matches'. 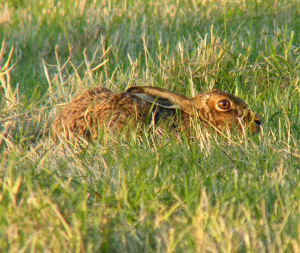 Two hares (usually a male and a female) stand up on their hind legs, face to face and box with each other. This peculiar spring behaviour is where the expression 'Mad as a March Hare' comes from. 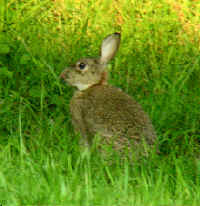 Hares are herbivores, eating grass and other plants. The leverets may be eaten by predators such as foxes, buzzards and owls, but the adults are generally quick enough to escape most enemies. One of the most important things which can be done to help increase hare numbers is to control their predators, particulalry foxes in the breeding season. Brown Hares are mainly nocturnal and are very difficult to count because they are so shy and hard to see when they are concealed in their forms. Because of this, no-one is quite sure just how many hares there are in Britain, or even in Devon. However, the indications are that their numbers have declined over the last century. 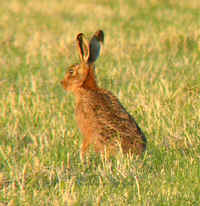 Brown Hares are found all over Devon in small local areas. They are not found at the Woodland Education Centre in Offwell because the habitat is not ideal for hares. 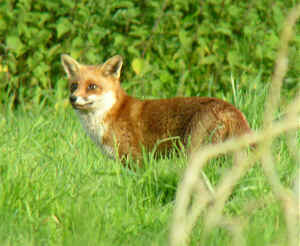 However, they can be found in the surrounding area, preferring large, open fields in farmland. 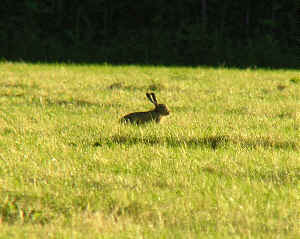 Brown Hares are also favoured by having a diversity of crops in their immediate area, rather than just grass. Changes in farming methods over the last 50 years are likely to have had a major impact on hare populations. 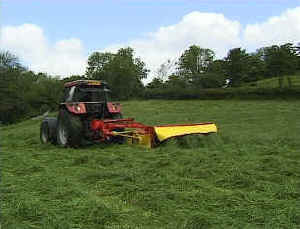 In particular, the switch to cutting grass several times a year to make silage, rather than leaving it to grow much longer and turning it into hay, will have had an effect. This is because the leverets are particularly vulnerable to cutting machinery in grass fields.